In simplest terms a WordPress child theme is a theme that you basically attach on top of an existing WordPress theme. 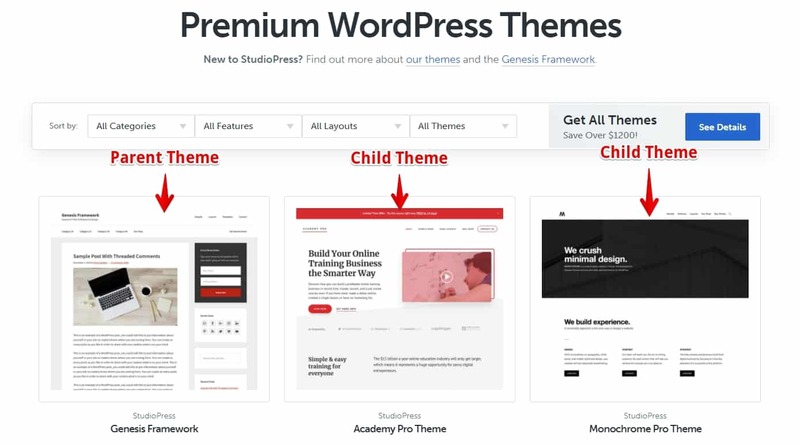 If you want to make small changes to the way that an existing WordPress theme looks, performs, or functions, then you should be using a WordPress child theme. It’s very easy to get confused when you’re trying to figure out the differences between a WordPress theme and WordPress child theme. Think of it this way. Your WordPress theme is a collection of different widgets, coding, and style variations. You like everything about it, but you don’t like the way that the menu looks. With a child theme, you can change the way the menu looks and feels without having to create the entire theme all over again. Once your changes are complete, you save your customizations as a new theme and use that on your website. You still have all the core functionality of your original theme, but you have now added some new aesthetic elements to the original theme and created a child theme. One great example of what is possible with WordPress child themes can be seen at StudioPress. When you visit the StudioPress website, you see a variety of different themes like those in the image above. My personal favorite for affiliate website is the Eleven40 Pro Theme. At first glance, these all look like they are their own unique WordPress themes. In reality, there is only one WordPress theme, the Genesis Framework, and there are many different child themes available for the one parent theme. As you can see by looking at just a few of the selections available at studio press, you can make your website look completely different by using a child theme. Now that you understand what a WordPress child theme is, you’re probably wondering why you should use one in the first place rather than just changing the code to the original parent theme. Aside from being able to have your own customized theme, the biggest reason that you should install a child theme if you are doing any kind of programming changes to your WordPress theme is that if the original theme creator updates the theme and you haven’t created a child theme with your customizations, then when the theme updates you will lose all your customized code. So, if you haven’t created a child theme and you’ve made changes to the original theme in CSS, then your website will revert to how it looked before you added those changes. When this happens, the best-case scenario is that your site will look a little strange to you and your audience. The worst-case scenario is that your site may crash altogether and be inaccessible depending what kind of on coding had been done to the original theme. Thankfully, it’s very easy to install a WordPress child theme on your website. 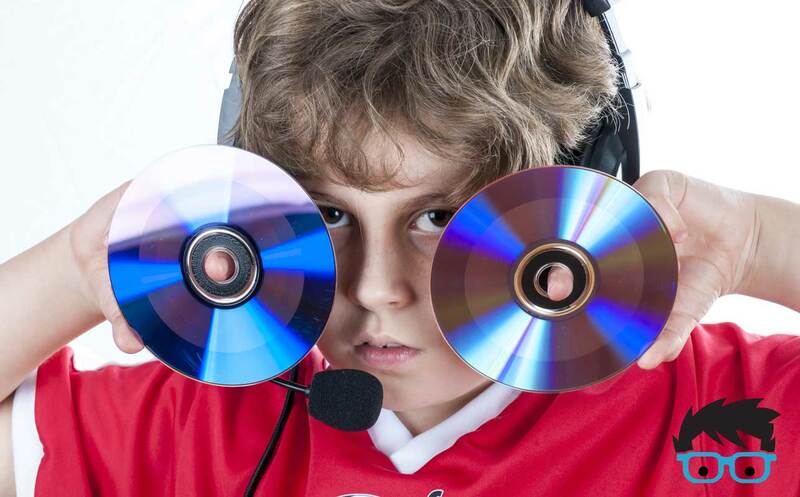 Okay, so you’ve decided that you want to install a child theme to your site but you’re not exactly sure how to go about doing it. The good news, it’s really easy to do. 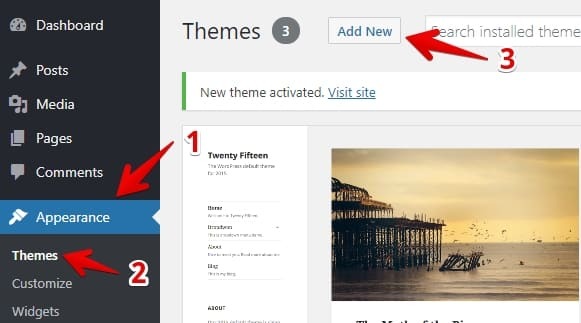 First, you must install the parent theme just like you would any other WordPress theme installation. Let’s say that were wanting to install the Eleven40 Pro child theme from StudioPress, the you’re going to have to install the Genesis framework. For this, head over to the appearance tab inside of your WordPress admin dashboard. Once inside of the Appearance tab, select theme and then click “Add New,” as shown in the image below. Once you select “Add New,” you’ll be taken to a screen where you can select a theme or upload your own. 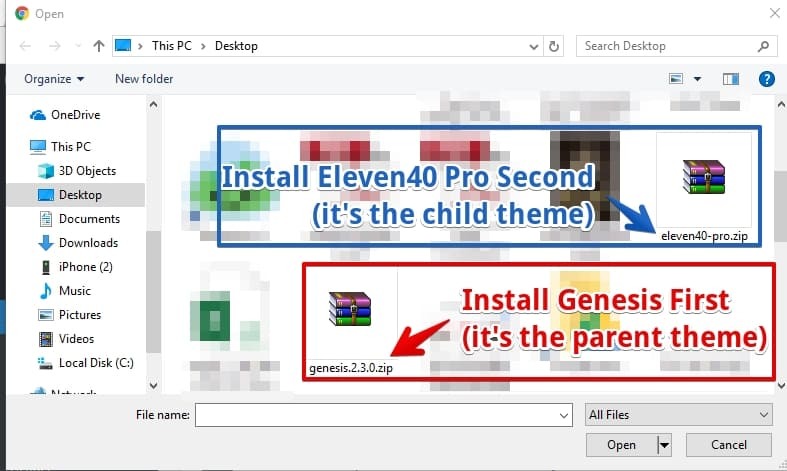 Since the Genesis Theme and the Eleven40 Pro Child Theme are both premium themes, you must upload them from your computer. To do this, upload the Genesis Theme first and then the Eleven40 Pro Child Theme second as shown below. It’s kind of a special circumstance, but when you’re working with the StudioPress themes they tell you that you need to install a child theme for Genesis. As you can see below, after you upload and activate the Genesis Theme, you’ll see a notification that says it’s a really good idea to activate a Genesis Child theme. And there you have it. In less than 10 steps, you have successfully installed your own WordPress child theme. Now, you have the knowledge to go and create any kind of design that you may desire for your WordPress sites. As you can see above, installing a WordPress child theme may sound scary, but it’s really very easy once you get the hang of it. Once you’ve mastered this skill, you can rest assured knowing that your sites will always look the way you want them to every single time someone visits them. If you’d like to see some phenomenal WordPress child themes in action, head on over to StudioPress and have a look around at what some of the creators and designers have been able to do with the original Genesis platform. If you’ve ever thought that WordPress didn’t offer enough design functionality, after visiting StudioPress you’ll be amazed at just how much design capability there is when you start to gain the benefits of child themes for WordPress.